“I just wanted to send a follow up note about how much I love this Vettori. I have now had the chance to perform on it in several venues and it’s got such a wonderful warm sound, and I’m excited to play it. 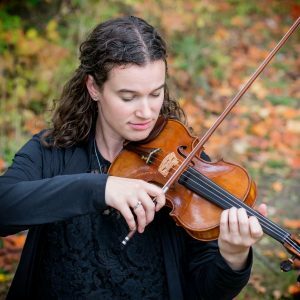 Rachel Huch, Violin, is Concertmaster of the Cleveland Opera Theater Orchestra, a member of the Cleveland Pops Orchestra and is on faculty at Cleveland State University where she teaches Violin, Viola, and Chamber Music. She is a Co-Director of the Western Reserve Chamber Festival which she helped found in 2014, and also maintains a thriving private studio, from which her students regularly receive top honors in adjudicated events, and acceptance into the highest level of youth ensembles and festivals. Ms. Huch is frequently sought out as a guest artist and adjudicator for schools and festivals throughout the United States. Ms. Huch has performed as a soloist and chamber musician on tours throughout the United States, Europe, and South America, and has shared the stage with artists of nearly every musical genre including Joshua Bell, Bobby McFerrin, Barry Manilow, Josh Groban, Stefon Harris, Kanye West, and Marvin Hamlisch. Ms. Huch is a laureate of various national and international competitions, including the Richardson, Arriaga, and Kauder competitions receiving various awards as both a soloist and chamber musician. In addition to her live performances, Ms. Huch has an active recording career and has been featured on television, radio, films, eCards, and numerous studio albums. Her recordings includes Classical, Pop, Rock, and Country albums with artists such as Lauren Lanzaretta, The Vig, Philip Fox Band, Pat Madden & Sally Potter, and Michael Bolton, and she can be heard on various American Greetings applications, ecards, albums, and shows including the newly released to Netlix show Buddy Thunderstruck. Ms. Huch has been invited to perform with orchestras throughout the US including the Bluewater Chamber Orchestra, Cleveland Chamber Symphony, Grand Rapids, Lansing, Jackson, and Akron Symphony Orchestras, and formerly served as Assistant Concertmaster of the Ashland Symphony Orchestra. As a chamber musician she has performed with the International Chamber Soloists and extensively in a number of string quartets, most recently as first violinist of the Azalea Quartet. Ms. Huch spent ten years on faculty at the Cleveland Institute of Music, and has also served on faculty at the University of Akron.